After writing about Zlata skirt for more than than a month, I've started feeling nostalgic about the actual sewing. While I was writing the tutorial posts I didn't have time for anything else, and so I gathered some ideas and inspiration and I've been dying to materialize them. 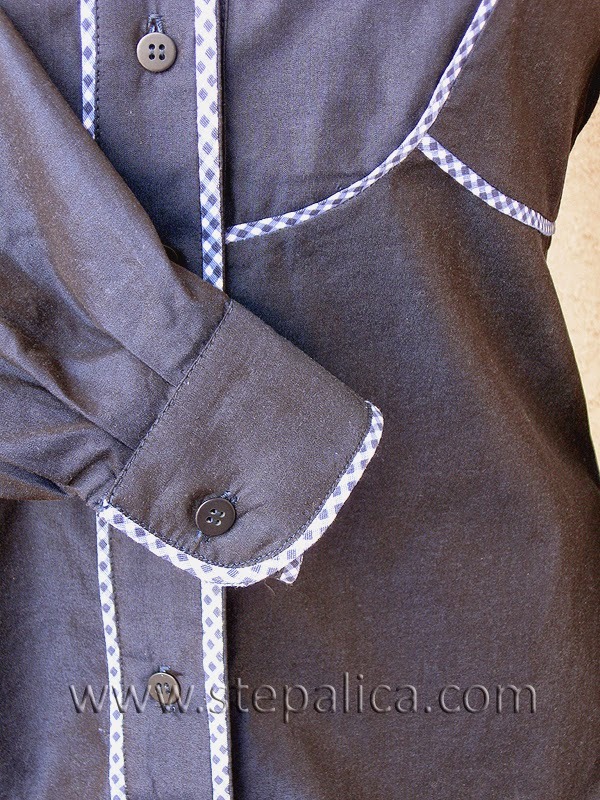 So, once the Zlata sewalong was over, I sat down and started sewing like a mad woman. I already have some new items to show you and I'm preparing some new tutorials for you that you'll be able to see soon. I've also joined forces with Anya of the blog Studio Artesania, who makes amazing jewelry out of polimer clay, so you'll see her works on me from now on. Along with showing off her jewelry we've found some other ways for merging our talents, but more on that in the months to come. 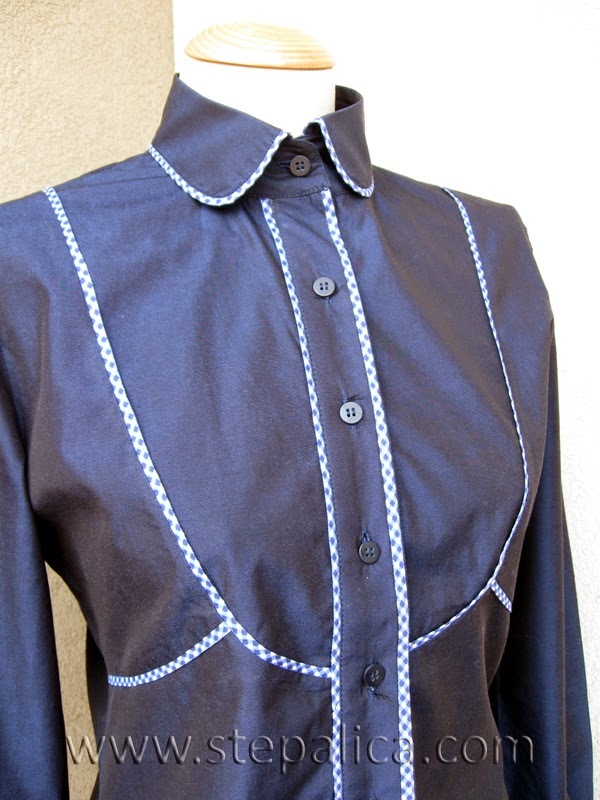 The first garment I'll show you is a lovely navy blue shirt with decorative piping details. You've probably already recognized the model - it's BWOF 01/2008, #108. This is absolutely the best shirt pattern I've had the opportunity to work with and somehow I don't feel like switching to another one. I've redrafted it and altered it countless times and wrote about it here. This time, since I used the plain fabric, I thought it would be nice to give the original pattern a chance once again. I'm sure you've also recognized the Zlata skirt from the pictures - I've been wearing it non-stop ever since I made it. However, ever since I gained some weight, I outgrew the size I've been wearing for years (38), so this time I traced the pattern in size 40. When I made the emerald shirt I noticed size 40 was a bit larger than I prefer, so this time I narrowed the pattern at bust and waist. Later on I realized I narrowed it too much, but it was too late to correct the mistake, so the shirt is a bit tight. Honestly, I don't stress about it, but I'll alter the pattern once again so that the next shirt I make (and I'm sure there will be more shirts) should fit me just fine. This has made me think - how much attention do you pay to fitting and do you make the clothes that's fitting you perfectly, or do you tolerate some minor imperfections? I love having a perfectly fitting clothes and I try to make my garments the best I can. However, sometimes I make mistakes since I avoid making muslins. If the flaw is minor, that does not make me look weird when wearing the garment, I'll consider the garment good enough to make it a keeper. Back to shirt. 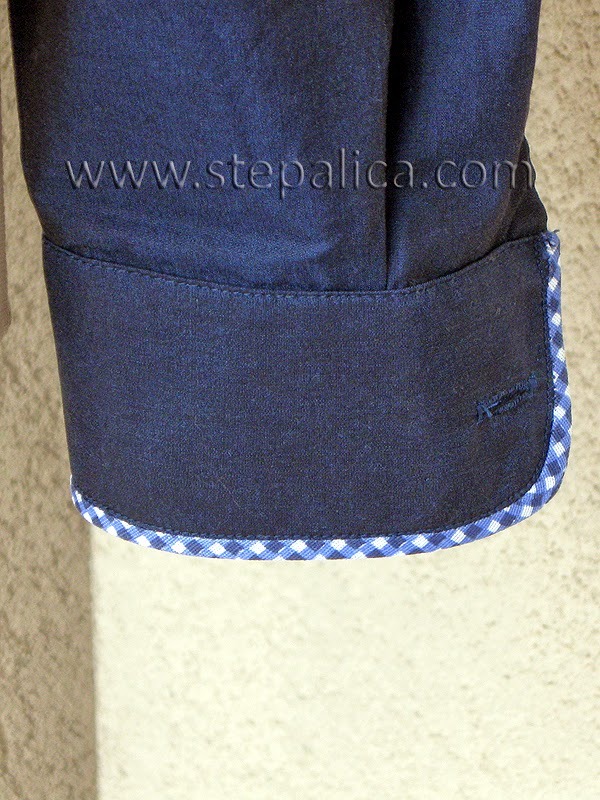 In order to break monotony of the plain fabric, I trimmed the shirt using a piping. The bias band I used has a plaid pattern in blue and white tones. The bias band was bought ages ago for a skirt I was sewing for my mom. 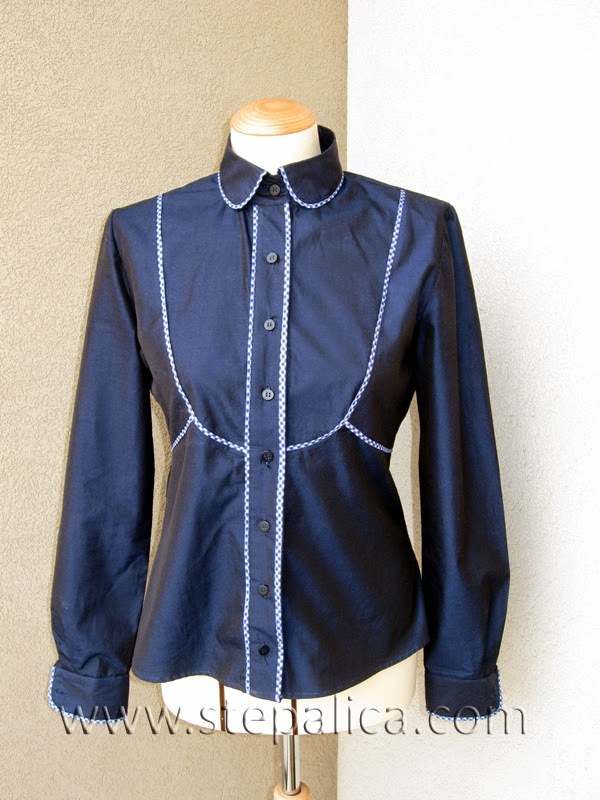 I can't remember why I didn't use it back then, but it matched perfectly with the navy popline, and there was enough of it to trim the seams ans pipe the collar and cuffs. Finally, here are some close-up pics to show you the details.